El Paso County Department of Public Works continues safety and drainage improvements along the southern portion of Monument Hill Road. This Phase I work includes construction of a free right turn lane from Monument Hill Road onto Woodmoor Drive, improvements to drainage along Crystal Creek and Monument Hill Road, and road reconstruction. 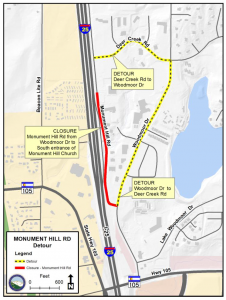 Due to weather delays and materials shortage, the road will remain closed from the intersection of Woodmoor Drive to the south entrance of the Monument Hill Church into April. Woodmoor Drive and Deer Creek Road continue to serve as the detour route for access to the northern portion of Monument Hill Road and Palmer Ridge High School. The ongoing project schedule remains dependent on weather and resources. Upon completion of Phase I, work will transition to the north. Phase II will require closure of Monument Hill Road from the south entrance of Monument Hill Church to the south entrance of Palmer Ridge High School, eliminating access from Monument Hill Road to Deer Creek Road. Monument Hill Church will be accessible at its south entrance on Monument Hill Road. Transition from Phase I to Phase II is expected to occur in April. Updated project information and a Phase II detour map will be provided prior to the April transition. For Phase II, Woodmoor Drive, Furrow Drive and County Line Road will serve as the detour. Drivers who need to use the detour route should plan for added travel time. Please reduce speeds and watch for workers, equipment, signs and barricades. El Paso County wishes to thank drivers in advance for their cooperation. Full road closure will accelerate the safe and efficient completion of this project. Funding for this project is provided through PPRTA.